Centre 42’s third edition of the ever popular Late-Night Texting is back this August! 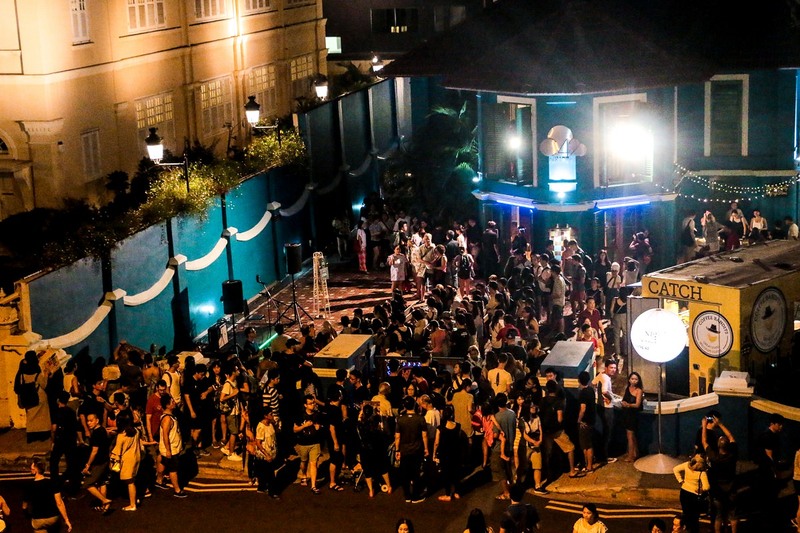 Held as part of the annual Singapore Night Festival, the past two editions of Late-Night Texting experimented with genres such as improv comedy and spoken word poetry, and have announced their exciting lineup of text-based performances! Taking place on 24th and 25th August from 7 – 11pm each night, Late-Night Texting will see over 30 free performances taking place at Centre 42 itself from four up and coming theatre collectives, in line with Centre 42’s aim to be a hub for the creation, documentation, and promotion of text-based works for the Singapore stage. As with how texting has reduced the length of messages year after year, to the point that we can practically speak in Emojis now, Late-Night Texting will feature see bite-sized, digestible pieces of theatre take centre stage. Late-Night Texting regulars Dark Matter Theatrics return with a new edition of Eat My Shorts, featuring a series of 10-minute short plays written by local playwrights and performed by a small cast of four actors. Also returning to the fray is Malay writing collective Main Tulis Group with their programme ETA: 9MIN, with dramatised readings of original nine-minute Malay- and English-language plays in two recurring sessions, themed “Arrival” and “Departure”. Meanwhile, look out for Ground Z-0 as they present Legends of the Islands, telling the stories of four of Singapore’s islands in the style of a multilingual street wayang performance, performed in English, Malay, Mandarin and Hokkien. Finally, youth theatre company The Second Breakfast Company presents Lovebites, exploring the different forms of love in Singapore across the years, with four pairs of excerpts from old and new Singaporean plays. Performances aren’t the only thing visitors can look forward to – the text will take the form of physical books and publications from local independent bookstore BooksActually, who will be setting up a pop-up hawking books and magazines and curate a programme of panel discussions and book launches. And no worries if you’re not a night owl – Coffee Bandits will be driving in with their bright yellow food truck to the Centre 42’s courtyard to keep visitors satiated and full of caffeine throughout the night. This year, be part of Centre 42’s 2018 edition of Late-Night Texting, and have a taste of the bite-sized theatre Singapore has to offer.